The LEGO Movie 2 has now hit the big screens in the UK. That means we recently got to not only check out the film but also play a bit of the upcoming game based on the movie. When it comes to LEGO games, they've had a pretty formulaic template for the last few years, but TT Games has attempted something different with this one. No, really. They have! Gone are the party systems where you could have multiple LEGO characters follow you about and help you take on whatever foe or puzzle you might come across. In The LEGO Movie 2 Videogame, players can go through the whole game as just one character of their choice from a list of hundreds, or even just their own custom character because abilities now work across the board. Don't worry though, drop-in/drop-out co-op is still in so you can enjoy your LEGO adventures with pals. In previous games, you'd need specific characters to perform certain tasks to solve puzzles, but in The LEGO Movie 2 Videogame once you unlock a new building schematic or gadget you can use it with whichever character you like. When it comes to building something you just need to make sure you've collected the right colour bricks from smashing items around the map and then you're set. It's something that's pretty similar to the popular LEGO Worlds game. The schematics you unlock aren't just for building things like sprinklers or a springboard to progress through the levels, but also include vehicles, entire buildings and quest related items too. There's a sandbox mode called Syspocalypsestar, which lets you build a range of new and exciting things to your heart's content. And as you progress through the game, so does Syspocalypsestar, growing to become a thriving city full of life. 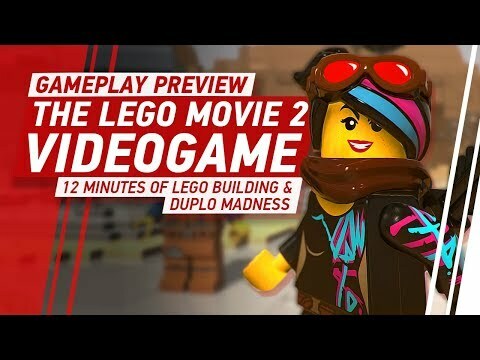 There's actually quite a bit of new content in The LEGO Movie 2 Videogame, which is a breath of fresh air especially to players who might've started getting slightly bored of the usual formula. You can check out some of the new content in our latest preview below. The LEGO Movie 2 Videogame will be heading to PlayStation 4 and Xbox One on 26th February in North America and 1st March in Europe.